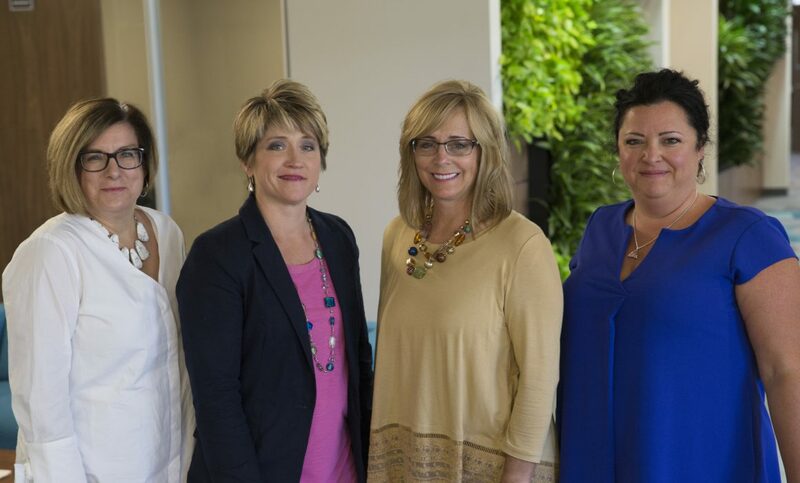 Jennifer Young Dzwonar, Katherine Coble, Karen Alter, and Jennifer Berry (left to right) traveled different paths to and within Borshoff, and each brings a distinct personality and skillset to the job. But all arrived at the same place: principals, partners, boss ladies, Borshoff’s owners. Dzwonar was raised by a minister and a therapist, so serving people has always been at the heart of work. When Dzwonar, also known as JYD, was in her late 20s, she’d already represented McDonald’s in her first agency job and was putting her Indiana University political science degree to use handling media relations for an elected official and a department of state government. But she wasn’t loving it. She applied to Borshoff in 1994 but wasn’t hired. But a few weeks later she received a surprise call from then-principal Erik Johnson saying, hey, circumstances had changed and asking, would she like to come work for the agency? Like her parents, helping people solve their problems is JYD’s passion. “We just solve them in a communications context,” she says. She also brought media and speakers training experience to Borshoff and soon began developing the foundation of the spokesperson training curriculum we use today. Alter was the director of communications for Kappa Alpha Theta fraternity headquarters in 1997 but was intrigued by agency life when she first interviewed with Borshoff. Like JYD, she came out of her first Borshoff interview process empty handed only to get an offer for a different job a few weeks later. When she started, the creative department consisted of two designers. Founding principal Myra Borshoff had always understood the value of design in communication, but Karen saw an opportunity to, “add a little magic” to client work and help to leverage the creative department’s skill and talent. In 1999, Borshoff hired Jennifer Berry to replace a production designer. The creative department had grown to four designers by then and, “were always open to evolving the agency.” So she threw herself into building Borshoff’s ad business with Alter. Karen started pounding the pavement to build Borshoff’s advertising business, making 15 to 20 cold calls a week. Their passion paid off. By 2006, advertising and creative services was on equal footing with the public relations business Borshoff had built its name on. Katherine Coble moved to Indianapolis for love. She was working in St. Louis for a global agency when she began dating a man who lived here. Because he had kids, she packed up and joined them here in 2002. Jobless, she cracked open the Indianapolis Business Journal’s Book of Lists and sent her resume to the top five public relations agencies. Having worked for Greyhound and for SBC Communication’s agency partner, Coble’s special interest is large corporate clients. The focus allows her to invest fully in the account and, “wear my clients’ emotions on my sleeve.” But her interest in the client-side also led her away from Borshoff for a short time. In 2008 Katherine accepted a position at a large Indianapolis-based health insurer but says she quickly found that, “my heart was still here,” at Borshoff. When a former client learned of Katherine’s buyer’s remorse, she offered to play matchmaker. Erik called and Katherine answered. She told him that she was all in and less than two years after leaving, she rejoined the agency. Katherine had a new goal she hoped to achieve: ownership. In 2007 JYD became the first of the four to make principal, joining Borshoff’s three original partners, Myra Borshoff, Erik Johnson, and Susan Matthews, in ownership. Karen’s success on the ad side led the owners to elevate her to senior vice president that same year. “I was at the table a lot with them,” she says, “but I still didn’t have the information I needed” to grow the business the way she wanted. She never planned on becoming a principal but she took ownership of part of the company’s growth. Myra sold her ownership stake in 2010 and change quickly came after that. That year, Karen says, “I got stupid cancer.” She had surgery and underwent 12 weeks of radiation with two weeks of chemotherapy that fall. Chemo hit her hard and she was admitted to the hospital for part of that time. Karen was only back in the office a few weeks when Erik and Susan approached her at the company holiday party to talk about her becoming a principal. Then Erik retired in 2012. Two years later, Susan told JYD and Karen that she, too, would be selling her stake to enjoy retirement with her husband. She gave them 18 months notice and began working with them on a transition plan, but JYD and Karen already knew who their next partners should be. Borshoff’s owners rang in 2016 with a new dynamic: JYD, the Wooer who happily attends an endless stream of breakfasts, lunches, dinners, board meetings and fundraisers on our behalf. Karen, the Activator who sees potential and starts moving toward a future she believes will be great. Jenn, the Strategist who asks, “why?,” until the minute work ships out the door and then asks how we could do it better the next time. Katherine, the Achiever who stokes her fire each day by learning, improving, delivering. Borshoff’s principals possess four distinct personalities, skill sets, and leadership styles. In a world where less than 6% of S&P 500 CEOs are female but women account for 41% of employees who make purchasing decisions and make 85% of household purchases, Borshoff’s boss ladies possess the experience, expertise and perspective to help our clients achieve their goals. Enough about Borshoff’s owners – go check out our work!